Anything that comes out of the mouths of Ramon and Jessica results in a feel good high that lasts until morning. 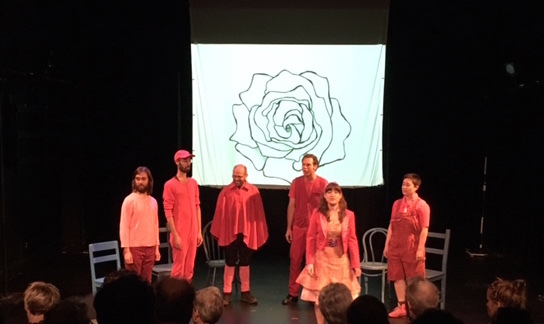 Tonight, Ramon (aka Dina Maccabee), Jessica (aka Jesse Olsen Bay) and their all-star a cappella ensemble performed Roses are Blue, threading their complex music with Gertrude Steins children’s tale,”The World is Round“. You can’t go wrong with a capella and Stein – they are made for each other. It wasn’t as easy as saying , “a rose is a rose is a rose” – their first explosive performance in 2016, with loose ends sticking out, generated so much enthusiasm that an Indiegogo fund raiser was launched – and those funds birthed this performance. The polish shows, costumes are a rummage sale mix of reds and oranges, which brings out the characters of these eclectic performers – and that is important because they not only sing but act and mime the story lines. Screen projections were used also – but did not do much to embellish the captivating voices.The sets are an assortment of chairs in an almost electric blue that standout on the dark stage. The interlocutor – Harold Pierce has been added and is a great addition in helping the story line, which can be necessary with Stein’s free floating language. He also took on the role of Roses’ loyal dog with a stunning human to animal transition. This is a coming of age story of Rose who questions her identity – if she were not named Rose would she still be Rose and Willy – who is always. “I Willy”.